Lawsuit lovers the Eagles are taking the band's latest incarnation out on the road next year. 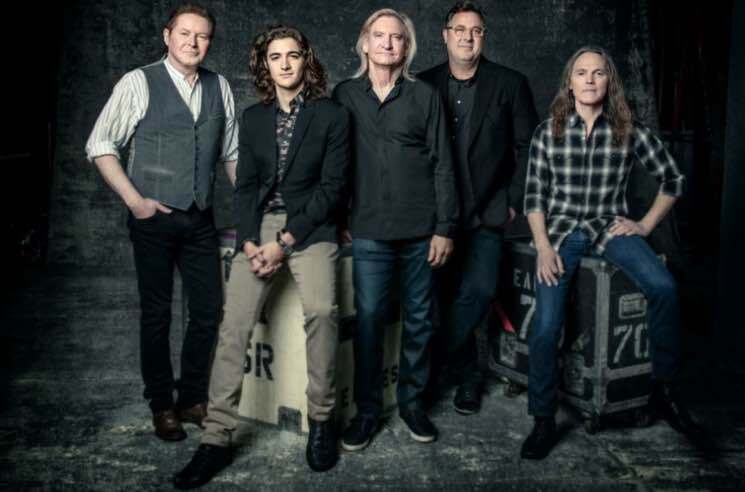 Led by Don Henley, Joe Walsh and Timothy B. Schmit, the lineup will be rounded out by Vince Gill and the late Glenn Frey's son, Deacon Frey. The upcoming string of dates will find the Eagles taking on a run of stadium shows, some with Jimmy Buffet, some with James Taylor and others with Chris Stapleton. Other shows throughout the run are simply dubbed "An Evening with the Eagles," and that's what will be coming to Canada for a pair of stops. The Eagles will play Rogers Arena in Vancouver on May 10, followed by a show at Toronto's Air Canada Centre on July 15. See the full list of dates down below. Tickets for the upcoming tour go on sale to the general public on December 2 at 10 a.m. local time. UPDATE (11/30, 11:20 a.m. EST): The Eagles have now added a pair of Alberta dates in Calgary and Edmonton, along with a second Toronto date. You can see the fleshed-out schedule below.